When you’re planning a trip to Vacationland–dreaming of butter-soaked lobster rolls, lighthouses dotting a rocky coastline, countryside covered bridges, and going moose spotting in the woods–you want to be sure you’re picking the best time of year to visit. I grew up with Maine as my backyard, and I can tell you that your visions of how spectacular it can be are entirely accurate. Now that I no longer live in Maine, I have limited time that I get to spend there each year. So like you, I try to plan my trips around the absolute best time to visit Maine. Each season has its merits, of course, but there are some months that are typically not very pleasant and others that can usually be counted on. 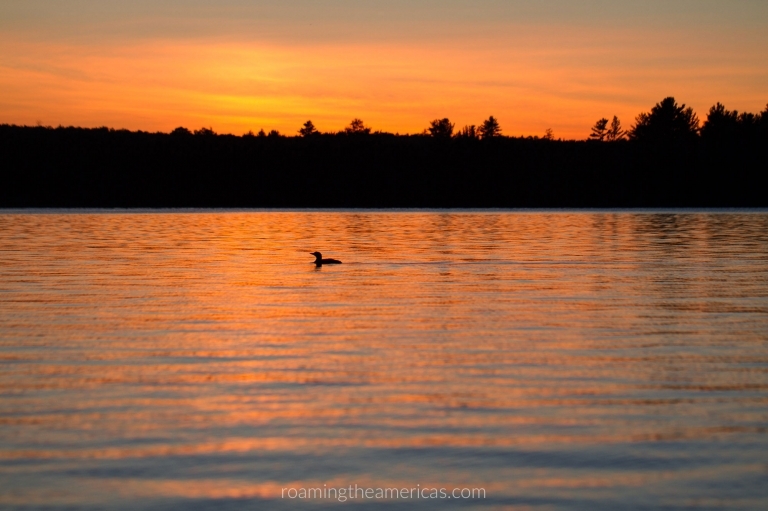 In this post, I’m going to share highlights of each of the four seasons in Maine, downsides of visiting during that season, as well as additional details for each month. It’s important to note that Maine is a big state with varied elevation, so temperatures and weather can be quite different throughout the state. That’s why I’ve included average temperatures and snowfall* for each month for six locations around the state (head to the bottom of the post to see these towns on a map). Got a trip to Maine on your bucket list? Pin this post to your travel board on Pinterest to keep it bookmarked! What Is the Best Time of Year to Visit Maine? BEST FOR: Winter can be a great time to visit for travelers who love cold weather sports or those who want to skip the summer crowds. 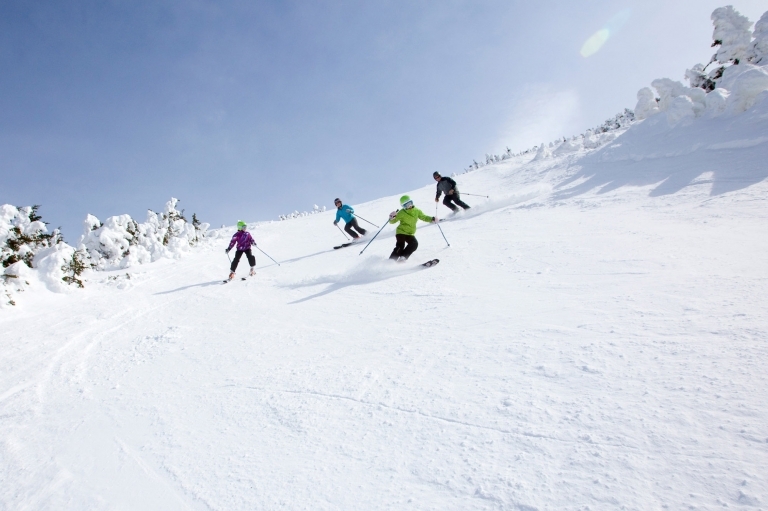 There are two large ski resorts in western Maine, plus plenty of opportunities for snowmobiling (with 14,000 miles of groomed snowmobile trails), snowshoeing, ice fishing, cross-country skiing, and even dog sledding. 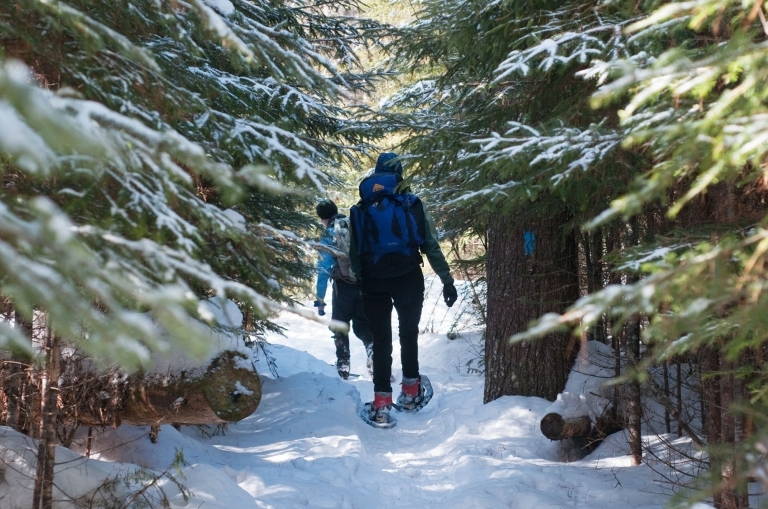 Head west and north for winter sports, stay in Portland for a little city life, or go to Acadia National Park or elsewhere on the coast for a serene winter getaway (read below for a note of caution). WATCH OUT FOR: One thing to keep in mind when visiting Maine in the winter is that many small businesses in touristy areas (like Acadia National Park and the southern beaches) are seasonal, so you won’t find as many dining or lodging options between November and May. I recommend a little extra research and checking directly with businesses you’d like to visit. What about driving in the snow? Unless you’re driving during a snowstorm, you don’t have much to worry about with road conditions, though a vehicle with snow tires and AWD or 4WD is useful. The roads are kept well-plowed, and they do so quickly during and after a storm. If you’re concerned, you can find out about current road conditions here. It’s always a good idea to have plenty of gas, blankets, flashlights, and other emergency supplies in case you break down. I also recommend keeping your windshield washer fluid full because the roads are treated with sand, not just salt, and your windshield will get dirty fast. Also, watch out for orange flags or signs on the sides of back roads that indicate frost heaves–you might otherwise be taken by surprise at what seems like a randomly placed speed bump! December can be hit or miss with snow, so a white Christmas isn’t a guarantee. However, skiing opens at Sugarloaf and Sunday River in November, so you should be able to catch some snow on the mountain if you’re planning a ski vacation. January and February are the “dead of winter” months that bring a lot of snow and, often, bitter cold. Winter festivals abound, and there are a lot of opportunities to get outside and enjoy the winter stillness. Come prepared for cold (or plan to stop at L.L. Bean), and you should have a great time. Tri-State Reciprocal Snowmobile Weekend is a weekend in January that allows snowmobilers to cross borders between Maine, New Hampshire, and Vermont to explore the trails across those New England states. February is “snow month” in Maine, but like January, it can still bring bitter cold. One thing to note is that school vacations fall during mid-February, so you may see more locals out and about depending on what you’re doing. Oy, March in Maine can be a bear. I remember loathing March when I was a teenager, and I’ve confirmed with friends who still live in Maine that my memories of it being awful are accurate. Descriptions used by some of my friends for this awkward in-between month: blah, cold, wet, dead, icky, windy, and lasts forever. March and November are consistently voted as the worst months in Maine by Mainers. Part of my disdain for March probably had to do with living in Maine and the fact that I had been shivering for 4+ months by the time it rolled around and I JUST WANTED TO SEE SOMETHING GREEN ALREADY. Visiting Maine in March may not be so bad, but it largely depends on when in March you go, what part of the state you visit (western and northern Maine are more likely to have snow than the coast), and the particular temperament of that year’s winter. Snow sports lovers enjoy the warmer temps (read: less extreme cold) combined with a decent chance of still having snow on the ground. It’s a lot more enjoyable to spend the day snowboarding if it’s not -20° F.
The end of March starts to get into mud season (read on in April for more). It’s also usually the month for maple tree tapping, although this can start as early as February and spill over into April. So, in a nutshell: March in Maine is complicated and highly unpredictable. Maine Restaurant Week is a great time to explore the culinary scene in Portland and southern Maine. Maine Maple Sunday takes place on the fourth Sunday of March every year, and sugarhouses all over the state open their doors to offer samples, tours, demonstrations, and other activities to the public. There’s nothing like the feeling of starting to see green emerge after a long winter. And watching the mercury rise above the 50° Fahrenheit mark is cause for breaking out the T-shirts from winter storage and driving around town with the windows rolled down. That’s how Mainers feel about the spring months…but what about visiting Maine in the springtime? BEST FOR: While it’s not what I would consider the best time to go to Maine, the spring off-season brings the benefit of less crowds, bearable (albeit still cool) temperatures, and not as many bugs. It’s also a nice time to start seeing wildlife, such as whales, puffins, bald eagles, and moose, as well as the start of the fishing season. WATCH OUT FOR: Many small businesses in touristy areas (like Acadia National Park and the southern beaches) will still be closed in early spring, though they start to open up throughout April and May. By Memorial Day, things should be up and running for the summer season. Spring and early summer is also known by locals as “construction season,” so be aware that this may make some travel more challenging or detract from your enjoyment. Also, excessive amounts of mud. Affectionately dubbed “mud season” due to the ground (finally!) thawing and the snow melting, April in Maine is a slog to get through. River banks overflow and everything is brown (including the still-melting, 20-foot snow banks in grocery store parking lots). Personally, I wouldn’t recommend visiting in April. However, one notable event that draws outdoor adventure lovers from all over the country to inland Maine is the Kenduskeag Stream Canoe Race. It’s the largest paddling event in New England and has been running for more than 50 years. Coastal Maine will still be chilly but may be nicer than inland Maine at this time of year, especially late April, thanks to the tempering effect of the ocean. Some locals love late April through mid-May in Acadia National Park because spring is in the air, and there aren’t many visitors on the island yet. May in Maine is the month that feels decidedly “spring” to me. Maybe it’s because I loved having flowering trees twice each year during college–starting in April in Pennsylvania, and then again in mid-May when I went home for the summer. If you enjoy spring weather and want to beat the summer crowds, May can be a nice time to go to Maine. Keep in mind that black flies–which are like little gnats that bite–start to emerge during May. May is also fiddlehead season! Fiddleheads are the still-rolled-up fronds of a baby fern that are harvested and cooked as a vegetable dish. They grow everywhere in the spring, and it’s a very Maine thing to pull over to the side of the road to pick some when you spot a good patch. Whether you go foraging for them yourself, or try a local chef’s take on this rustic delicacy, fiddleheads are a must for your spring trip to Maine! Ahhh….summer. This is, without a doubt, my favorite time of year in Maine. The months of July and August are particularly wonderful–from strawberry shortcake on July 4th to wild blueberry season to gorgeous camping and hiking weather. Throw in a lobster bake while watching the sunset over a lake, listening to the call of loons floating across the water, and it’s all pretty spectacular. BEST FOR: Summers are typically warm and mild, though they do see some humidity as well as random cool spells. 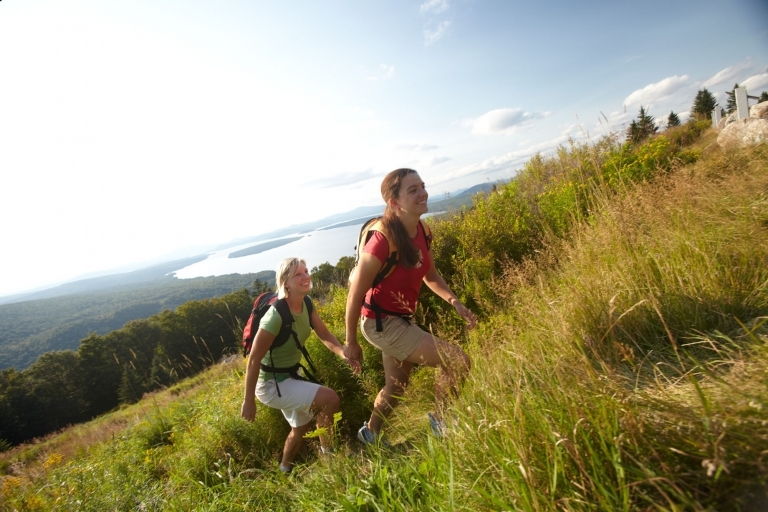 This makes a summer vacation in Maine perfect for anyone who wants to enjoy outdoor activities like hiking, camping, swimming, water skiing, biking, rafting, kayaking, or sailing. All areas of Maine have pleasant weather in mid- to late summer, so if you don’t want to be holed up in the air conditioning all day, the Pine Tree State is a perfect summer getaway. WATCH OUT FOR: Popular coastal areas will inevitably be more crowded during the summer, and this is the time of year that you’ll come the closest to anything resembling a traffic jam in Maine. Bugs are also a nuisance, but given that Maine doesn’t have terrifying sea or lake creatures, nor any poisonous critters, I don’t mind swatting away some mosquitoes and black flies. They’re less of a problem on the coast than inland, but it’s important to keep your tolerance level in mind. June can be hit-or-miss with temperatures. You may get blessed with summery weather, but it can still be chilly at times and isn’t usually hot. Late June is the start of strawberry season, and there are some amazing growers throughout the state. 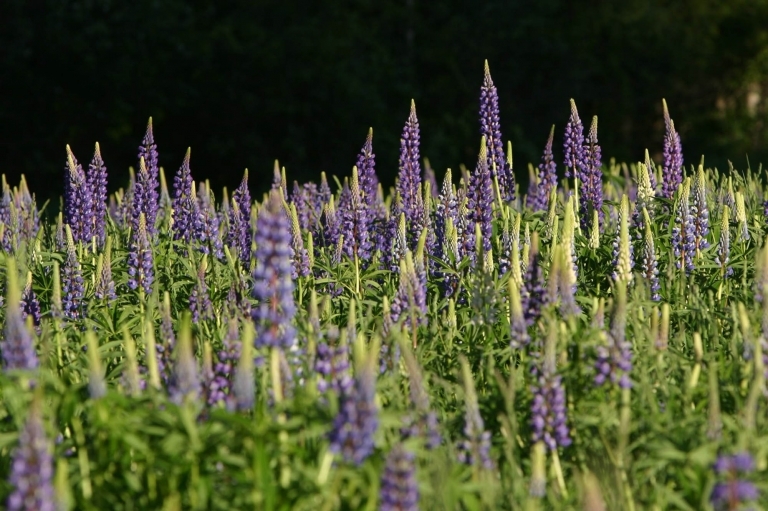 And mid-June brings lupine season–a gorgeous display of pink and purple wildflowers across the state. This month also welcomes two of the most loathed bugs: black flies and June bugs. In case you’re not acquainted with a June bug, it’s some kind of clumsy beetle (that’s the scientific classification, anyway). Their clumsiness puts them on par with moths—annoying critters that love to dive bomb you. Despite the June bugs and black flies, June can still be a nice time to visit Maine before the heavy vacation season hits in July and August. However, it’s not my top pick weather-wise. July is a popular month for travel in Maine, and it’s a great time to head to the beach or do anything outside. It’s usually warm, sometimes hot and humid, and sometimes chilly. Even during the hottest months in Maine, I recommend packing a sweatshirt and being prepared for temperature changes. Strawberry season usually lasts into the beginning of July, which means delicious, in-season strawberry shortcake on July 4th. (Seriously, try it. You will not regret your decision.) July is also the start of raspberry and blackberry season, both of which you might find growing wild. August brings generally warm weather in Maine, but it tends to not be quite as humid or rainy as July. It’s also the most popular month for tourism on the coast, which means expensive rates and booked out accommodations. This is the conundrum of traveling to Maine in the summer. It’s amazing, and everyone knows it–so it’s crowded. Experiencing a New England fall is a bucket list item for many people–for good reason. Whether taking a leisurely drive along a scenic byway, enjoying sweeping views of Maine’s wilderness from a mountain summit, or leaf peeping from a plane, fall is an amazing time to visit Maine. BEST FOR: Of course, leaf peepers love the gorgeous display of colors in late September and October across the state. But fall colors aren’t the only reason to visit Maine in autumn. Even as the air starts to get cooler, it’s still a lovely time to enjoy outdoor activities like hiking, camping, biking, or whitewater rafting. Fall is a great time to visit if you enjoy the outdoors. All areas of Maine are lovely at this time of year, but keep in mind that foliage peaks at very different times around the state. This site has some some general guidelines for the best fall colors based on region, as well as a helpful fall foliage map. WATCH OUT FOR: Later in the fall season, seasonal businesses in tourist-heavy locations will begin to close for the winter. October and November can bring a bit more rainfall than the summer months as well. For many locals, the weeks after Labor Day but before fall foliage are prime–kids have gone back to school, the warm weather often lingers, and most of the summer’s humidity has dissipated. Later in the month, the air starts to get crisp and chilly. It also brings apple season, and there’s simply nothing like fresh, cold apple cider on a fall day! Some Mainers say September is the perfect month to visit Maine. But remember that if you’re looking for fall foliage, you probably won’t catch it just yet unless you head far north. October is the month for leaf peeping in Maine! Keep in mind that some areas and higher elevations may reach peak color in late September, but many parts of Maine are best in early to mid-October. November is another oddball month (like April) that’s not really fall but not quite winter. It’s definitely an awkward in-between month that tends to be brown and dreary because the leaves are generally gone and there isn’t typically snow because the deep winter cold hasn’t set in yet. While it’s not a top pick, you may consider early November in southern or coastal Maine if you’re not coming from far away and just looking for an inexpensive weekend getaway. As you can see, the best time to visit Maine really depends on what you want to do and what part of the state you visit. I’m going to sum things up with a few ideas of when (and where) to visit based on activity. 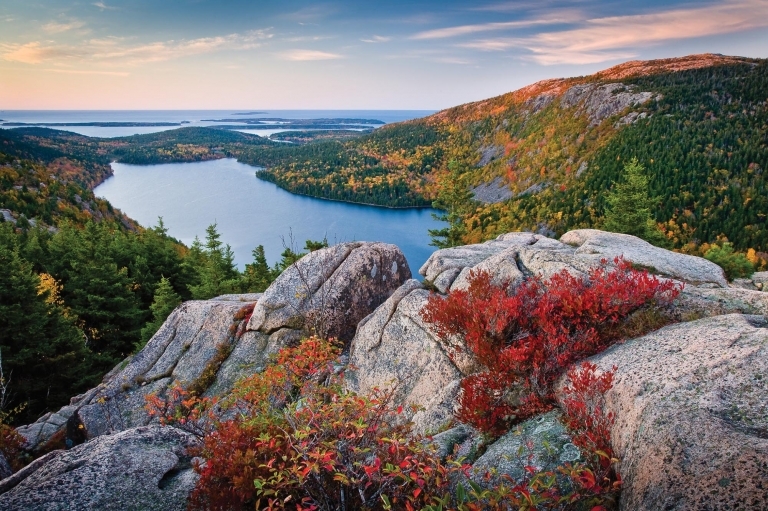 If you can’t choose between mountains and ocean views, head to Acadia National Park from July through October for great coastal hikes. Prefer a more mountainous landscape? Central and western Maine have you covered: try Mount Katahdin (Maine’s highest peak), the Bigelow Range, or the Moosehead Pinnacle Pursuit. The best hiking weather is from July through October. When it comes to rafting in Maine, thrill seekers won’t be disappointed. There are several rivers to choose from: Dead River, Kennebec River, and Penobscot River. 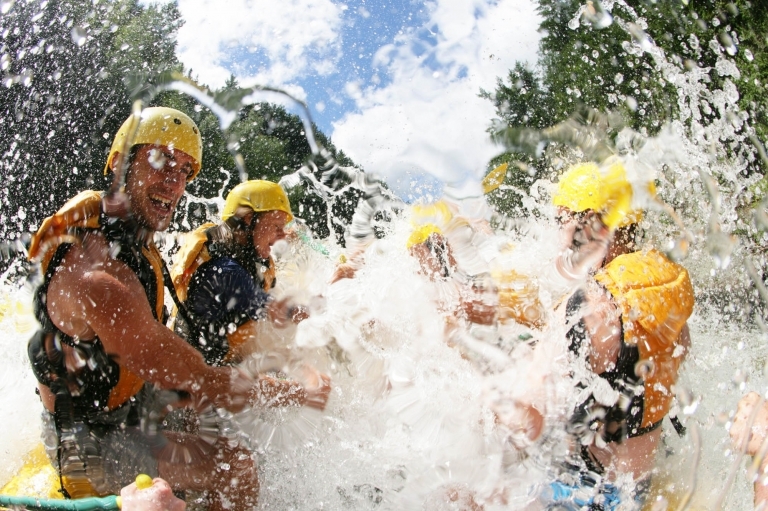 They are all dam-controlled, which means you’ll have guaranteed water flow throughout the rafting season. The Kennebec has Class 2-4 rapids and daily releases from May-October. Four of those are high water releases of 8,000 CFS. The Dead River has eight releases each season during May-October and Class 3-5 rapids. The Penobscot also has daily releases from late May-September and Class 3-5 rapids. For the most exciting rapids, go in May and June to catch the spring runoff. For warmer weather, July and August are usually great (go during the week if you want to miss the party crowd). And for fall foliage and fewer crowds, September and October are ideal. Maine puts on a pretty spectacular display of color in the fall. So when do the leaves change in Maine? The northern part of the state sees peak fall color in late September and early October. In central and western Maine, leaves are changing during the second and third weeks of October. And on the coast, peak fall color is generally the third week of October. This site has some some general guidelines for the best fall colors based on region, and you can find a Maine fall foliage map here. For many visitors to coastal Maine, whale watching is as much a part of a summer vacation as a fresh lobster roll on the docks. Maine has a lot of coastline and its ocean waters are host to many types of whales–Humpbacks, Finbacks, Minkes, and more. While the whale watching season runs from mid-April/May – October, the best time for whale watching in Maine is during June, July, and August. You might also spot some North Atlantic Puffins in mid-June through August. Of course, the question on many people’s mind is: What’s the best time to go to Maine for lobster? First, it’s important to understand the difference between soft shell and hard shell lobster. Hard shell lobster are firm and have lots of meat per lobster. As the weather warms, they shed this shell as they outgrow it, and their new shell is soft and spacious–meaning these soft shell lobsters have less meat per lobster. Soft shell are considered a delicacy and the meat itself is sweeter and more tender than hard shell. As the lobster continues to grow, its shell hardens over time and the molting process continues. Another difference between soft shell and hard shell lobsters: when cracking open a whole lobster, you’ll definitely need nutcrackers for hard shell, while soft shell can often be given a little crack and split open with your hands. So is there a lobster season in Maine? 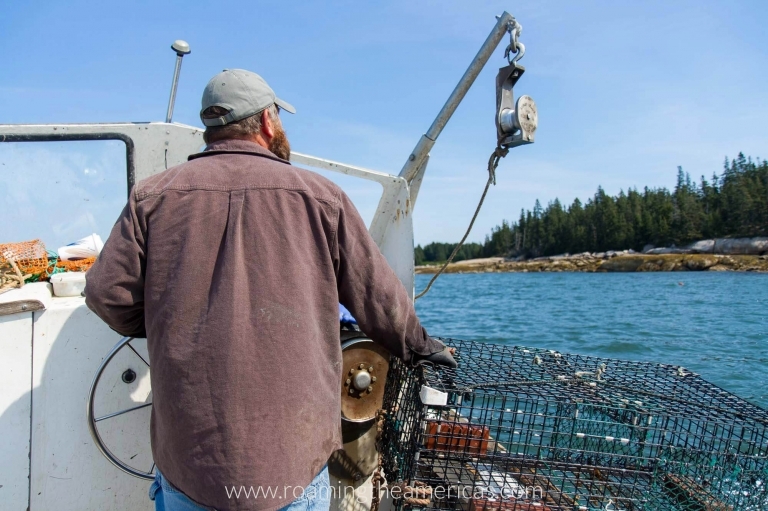 While lobster can be harvested year round off Maine’s coast, harsh weather and migration farther off shore make the winter months of late December through March difficult–limiting the supply and increasing the price. Late spring is a bit better, with “lobster season” starting to kick off. During May, the demand isn’t very high since summer tourists haven’t arrived, so you’ll find good prices on hard shell lobster. In the summer, the lobster move closer to shore and begin to shed their shells. 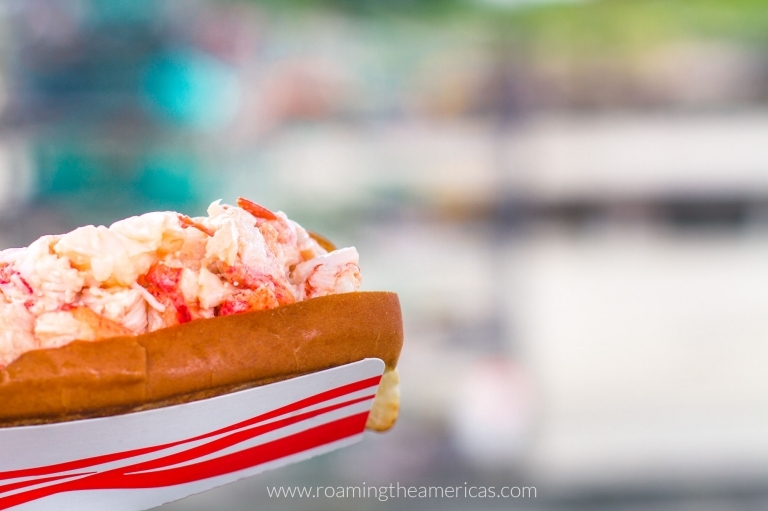 This is when most of us (myself included) think of indulging in a perfectly sweet lobster roll or having a lobster bake. Starting in July through early fall, soft shell lobster are plentiful, while hard shell are more expensive. By late September through late November or early December, the hard shell supply is excellent and there’s less demand from tourists, so prices are still pretty good before winter really sets in. With all this in mind, the best time to visit Maine for lobster is July – September, as you’ll be able to get plenty of delicate soft shell lobster, and you can still get hard shell if that’s what you prefer. What’s top on your list of things you’d like to see in Maine? When would you most like to visit? Let me know in the comments!